52nd Edition : March 2018. Ramadan demand and lower feeder prices present a ray of hope for Indonesian importers. Vietnamese importers are finally able to increase their prices as local supplies decline. The lowest prices quoted have remained stable at Rp37,000 per kg live weight while the highest prices available have slipped by about Rp1,000. As most sales are still taking place at around Rp38,000 per kg live I will retain this value for the indicator price for March. In short, it is still a buyers market with little hope of any movement until Ramadan begins on the 15th of May. The market will then wind up to its strongest point of the year in the last week of Ramadan from 7-14th of June when demand for the religious holidays is at its peak. As feeder cattle take at least 100 days before they are ready to sell, all cattle planned for sale in Ramadan have already been imported. The month after Ramadan and Lebaran is always a weak demand period so importers will be cautious about importing for the next few months. Many feedlots still hold overfat animals that can only be sold with significant discounts or offers of credit or both. This has allowed some retailers to introduce discounts to encourage throughput. 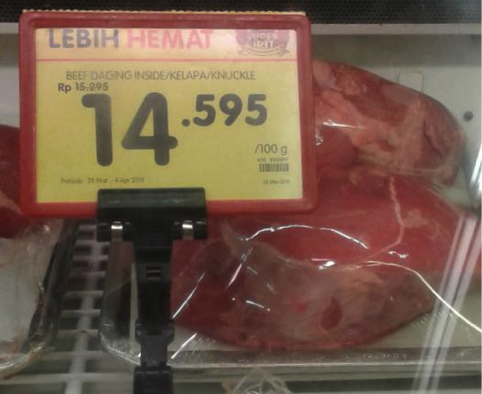 See photo below of discounted knuckle at a Jakarta supermarket during March. Photo : Knuckle from Aussie live cattle in a Jakarta supermarket discounted from AUD$15.29 to $14.59 per kg. The only recent good news for importers has been the fall in feeder cattle prices in northern Australia starting at the end of March and expected to continue through April and beyond. My advice is that many factors are driving this weaker price from the destruction by fire of the very large Thomas Foods abattoir in South Australia to the generally dry season in Southern Australia and the continued weak demand from live importers. After holding up at around AUD$3.20 through the wet season, the feeder cattle rates in the north have suddenly slipped below $3 to around the $2.95 mark at last report. Experienced market watchers suggest that if the dry season continues for the next 6 weeks in south eastern Australia then the rate might decline much further. If the north Australian rate gets to the $2.80 area then Indonesia (and Vietnam) might well find they can justify an increased level of purchases over current levels. Given the huge volume of Indian beef that will be available it remains to be seen just how much fresh beef the Indonesian market can take regardless of low prices. If the Ramadan sales are good and the northern feeder prices remain weak then importers may well commence large scale imports immediately after Lebaran. The Indonesian government is in the process of releasing a series of 6 tenders for the purchase of a total of 15,000 breeding heifers from northern Australia. These animals will be distributed to small farmers across the archipelago from Aceh to West Papua. Producers can expect to see the first of these tenders result in purchase enquiries across northern Australia in June or July with demand continuing through to the end of the year. The Australian press has recently reported the sale of PT Elders Indonesia, a wholly owned subsidiary of Elders Limited in Australia to a group of investors including Indonesian and Australian partners. The sale includes the feedlot and abattoir assets but not the Elders meat trading business which will continue to run by Jason Hatchett under the PT Elders Indonesia banner. I am very glad to hear this as I am a regular customer of the Elders Indonesia meat products both in the form of fresh beef and lamb from their cold stores as well as Elders beef in a number of Bali restaurants. 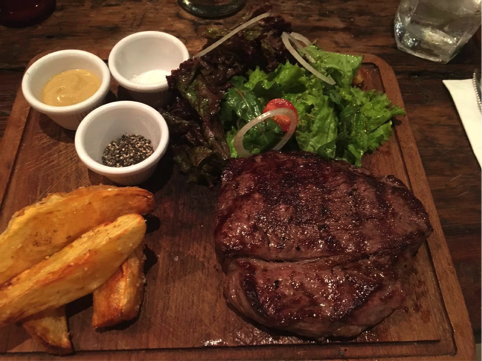 I recently visited my favourite steak house in Bali, “The Butchers Club” in Seminyak managed by Gareth Moore. On this occasion, George Black and I decided to try the 400 gram Killara Black Angus, dry aged rump and it was spectacular. I would even go so far as to say that it was as good or better than the magnificent Killara rib eye as the flavour was exceptional while the juiciness and tenderness were outstanding. Photo : 400 gram dry aged Killara rump with chips and salad – perfect. 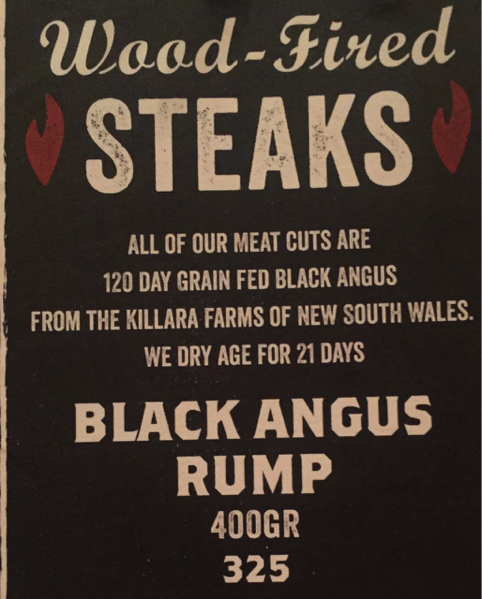 Photo : The rump on the Butcher Club menu is great value at AUD $32.50. For the first time in quite a while I am reporting an increase in the slaughter cattle prices across the board in both north and south Vietnam. The increase is only by Dong 1,000 per kg but it is a significant milestone as the live cattle importers have been unable to increase the price to their butchers for almost 2 years resulting in a steady decline in the numbers of stock being imported from Australia. The new indicator price is D68,000 per kg live weight for fat steers in Ho Chi Minh City, bulls are up to D73,000 and heifers can achieve up to D65,000. Rates in the north are generally D1,000 per kg higher than those in the south for all classes except for fat heifers which are the same at D65,000. My agents tell me that these increases are a result of declining alternative supplies especially from Thailand where reduced numbers flowing through from Myanmar as well as tight restrictions on the use of Beta-Agonists within Thailand has significantly reduced the numbers of animals available for export to Vietnam. At the same time domestic supplies are low along with reduced availability from Cambodia and Laos. 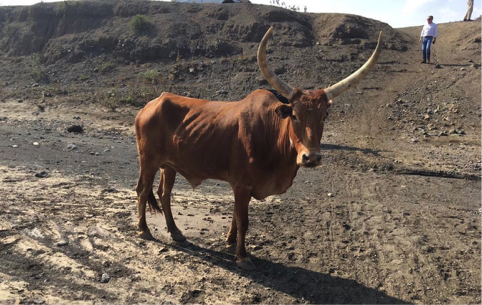 I am also advised that HAGL, one of the largest players in the Vietnamese feedlot business with a one time feedlot capacity of over 80,000 head has ceased its business and is in the final stages of liquidating its remaining breeder herd. The final closure of this enterprise which once dominated the Vietnamese industry may help to bring greater stability to the surviving industry. 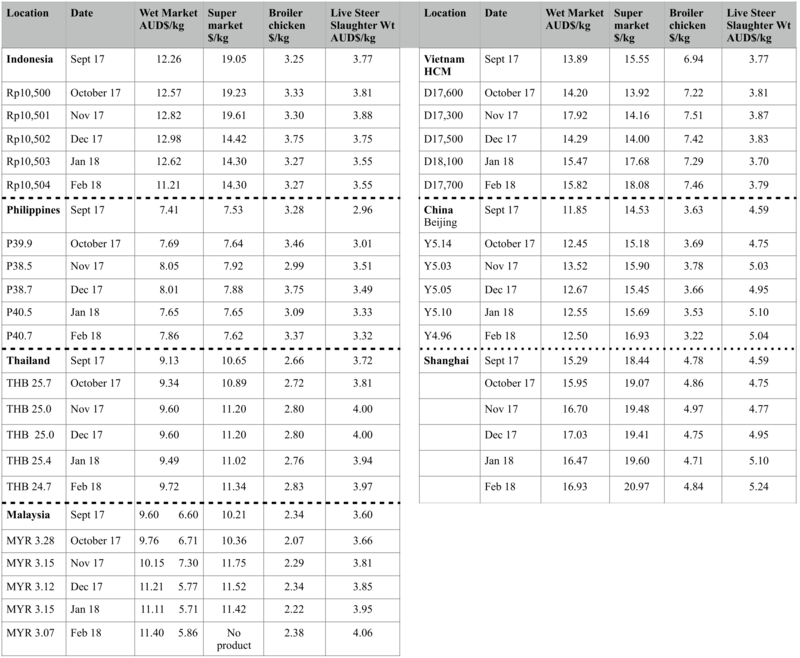 Prices have declined slightly as demand for exports is weakening. The indicator price for slaughter steers is now Baht 95 per kg live weight with the next movement likely to remain downwards. The three big market drivers are local demand, imports from Myanmar and exports to Vietnam. While local demand appears to be steady, imports and exports are both well down. 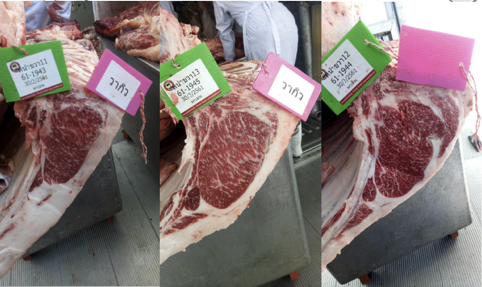 Photo : Thailand has an enormous meat industry with these Waygu steaks representing the very top end of the market. This apparent price rise is once again purely due to the surprising continuation of the strengthening of the Ringgit. Given the very small size of the Malaysian live cattle and beef industry, I am giving serious consideration to stop my reporting on this market. Prices steady again for March despite lower meat consumption for the Easter celebrations for Christian Filipinos. Slaughter cattle prices continue firm in both Beijing and Shanghai with rates in both locations quoted as Y24-26 so I have retained Y25 per kg live weight as the indicator price for slaughter steers for March. Once again, the notable aspect of this market is reports of the continued high level of inquiries from large numbers of Chinese investors wishing to start new businesses associated with beef or live cattle imports. The noise is loud and getting louder. The search for new supplies begins with immediate neighbours like Myanmar and Laos then continues to distant sources including Australia, South America and Africa to name only a few. Laos is well located to supply China but its domestic cattle numbers are so small it needs to begin by rebuilding the quality and quantity of its national cattle herd. The two articles below appeared in the Vientiane Times during March indicating that the Laos government recognizes the need and is trying to encourage herd rebuilding to get under way. These articles are kindly provided by Mike Boddington from Jungle House in Vientiane. 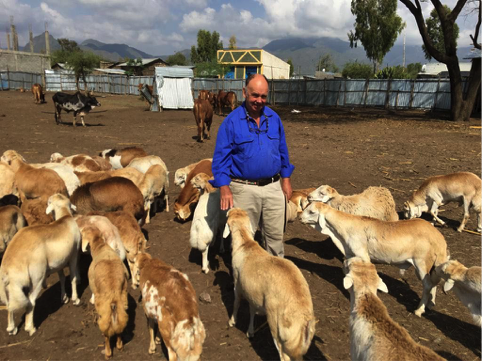 Photo from George Black : George with some fat tail sheep in Ethiopia. These sheep are slaughtered locally as well as exported live (through Djibouti) to Saudi Arabia and customers in the Persian Gulf. Photo by George Black : cull draught cattle being sent for sale for slaughter. 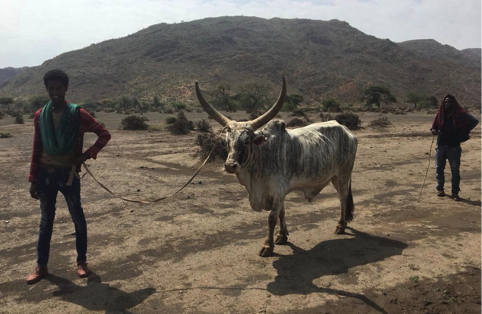 Photo by George Black : Ethiopia has about 50 million cattle which are mainly used for draught power. After their working life is over they are sent for slaughter with a small proportion also being exported live to Saudi Arabia and the Persian Gulf. Reblogged this on Indonesian Livestock Industry News. I emailed you some months ago regarding a JV with some Malaysian Royals …. Suffice to say it did not go ahead ! 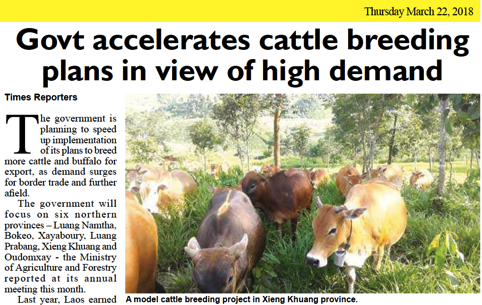 Anyway I am still living in Malaysia and noted with interest your report on the Laos cattle industry with particular mention that the Laotian government is looking to expand its breeding industry . Do you see any opportunities there for a consulting or management role ? I am quite happy to live in the area if needed. Cheers until we chat again.